Thomas M. Cooley was born on this date 192 years ago — January 6, 1824. Like many of Michigan’s early justices, Cooley was born in New York state and moved here as a young man. 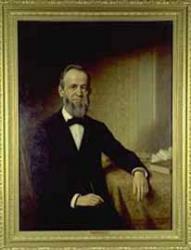 Cooley settled in Adrian, Michigan, in 1843, and was admitted to the bar in 1846. Read more about Cooley in the fall issue of our newsletter here, including the December 1883 letter that he wrote to U.S. Supreme Court Justice Samuel Freeman Miller.